How does the Pinterest Contest work ? Entrants can participate with an email address only once. All photos are hosted in Pinterest servers. Be careful, desktop visitors are able to check the photo gallery, they can also vote and participate. With the mobile it is only possible to participate with following operating systems: Android last version and iOS 7/8. Interact with your community with pictures! Find out if this app matches your goals with the contest comparator! The public choice: Ask the visitors to vote for the best picture. A visitor can vote only once for a photo, but for as many photos as he wants. If the contest will be installed on Facebook, the participant has to like the Fan Page and accept the application. Jury decision: You select a jury that picks the best photo. Your contest gallery is still open for visitors, but they can not vote. Both of them: Your fans vote for their favourite photos. The jury picks afterwards a winner out of the most popular pictures. The platform does not provide this case in particular, but your jury can make his decision at the end of the contest by choosing one of the most voted pictures. Once the contest is finished you can click on “Winners and Entrants”. A page appears which shows all the entries (from the most popular to the less popular). Click on the participant you want to choose as the winner of the contest. Open the winners tab and drag and drop the participant on the gift you want to offer to him. 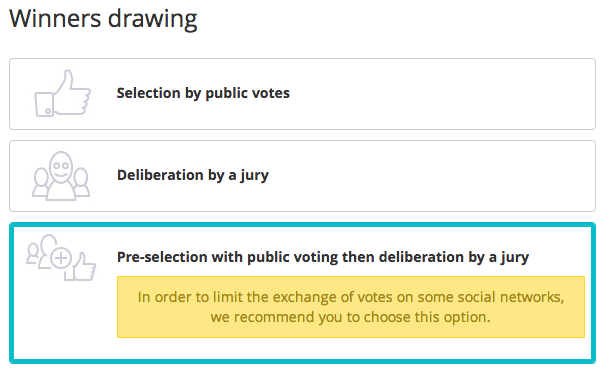 Click on the “Moderation” button to accept or reject entries. Online: If you choose to moderate entries after they are posted, reject or accept them in the “online tab”. Abused: Entries that are reported by participants are listed in the “abused tab”. You can find them in the gallery, but they are not any more online. Censored: You can find all the entries you rejected in the tab “censored”. The periodic mode is not is not available with this promotion type. How do visitors vote ? Visitor can vote for every photo they like when they are on the contest galery, once per photo. To validate their vote, they have to accept “Promotion” application via Facebook . It’s also important to know that vote are not Facebook Likes either Pinterest Likes. How to retrieve information about voters ? On the database export part of your contest, you’ll find a button which allows you to get these information in a CSV file.You’ll have following information : First name, last name, email address, date of the vote and link to the facebook profile. Be careful, since voters don’t fill a form with an opt-in, you’re not allowed to use these information for marketing campaign. Where can I spread my contest? Facebook blocks the application for the mobile version with the address provided from Facebook https://facebook.com/websitename/app_XXXXXXXXX”. This is why you should always use our permalink (the one which ends with “xg1.li”) which redirects the visitors automatically to the appropriate version of their device. Viralize your operations through the sharing options via email and via Facebook or Twitter.